Washington Wizards guard John Wall is set to undergo surgery on his right knee. WASHINGTON — Washington Wizards guard John Wall underwent successful knee surgery, the team announced Thursday. “He will begin the rehabilitation process immediately and is expected to be available for the start of the 2016-17 season,” according to a news release. “I am determined to lead this team back to the playoffs and getting healthy is the best way for me to accomplish that,” said Wall. Dr. Richard D. Parker at the Cleveland Clinic at Marymount Hospital performed the surgery. “John’s procedure went very well and should allow him to play without pain once he has completed his rehabilitation,” said Parker. Parker says the clinic has worked closely with the Wizards’ medical and athletic training staff to develop a plan to get Wall back on the court. Soreness in his right knee forced Wall to miss the final five games of the 2015-2016 campaign after starting in the 77 games of the season. 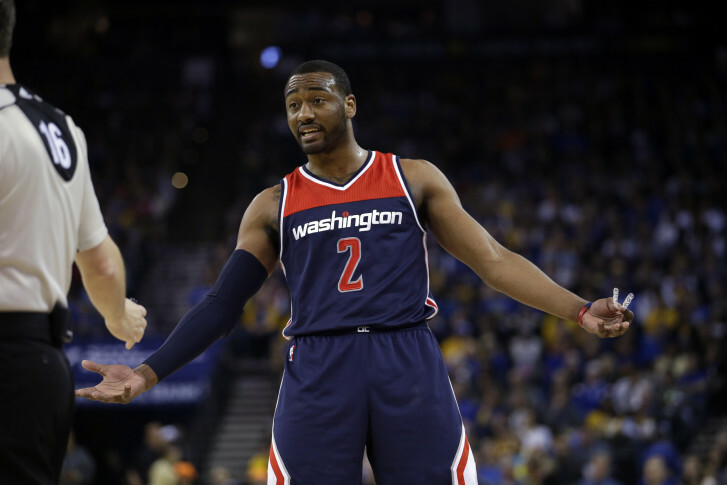 The discomfort in Wall’s knee did not become an issue until the morning of the Wizards game against the Nets on April 6. Wall missed the first 33 games of the 2012-2013 season with a stress injury to his left kneecap. The Wizards went 5-28 with Wall out of the lineup. Wall returned the next season and did not miss game as the Wizards clinched their first playoff spot in six years. This past February, Wall made his third consecutive All-Star appearance and finished this season as the team’s leading scorer at 19.9 points per game and was third in NBA at 10.2 assists per game. WTOP’s Colleen Kelleher contributed to this story.